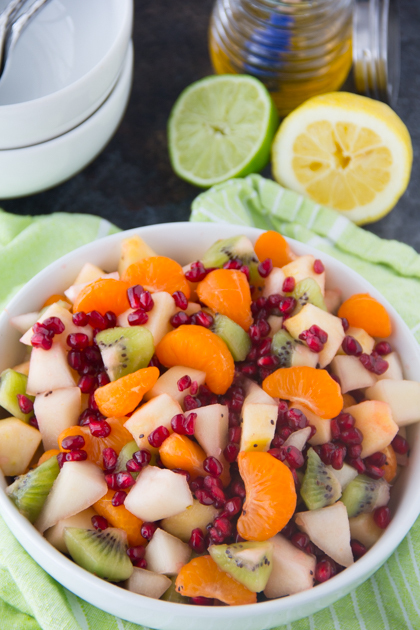 This delicious fruit salad combines fresh mandarins, kiwis, apples, pears, crunchy pomegranate seeds and a light honey lemon-lime salad dressing. Happy Valentine’s Day!!! How are you celebrating? With lots and lots of chocolate and decadence?!?!?!? I’d usually be celebrating with Oven Fried Chicken and Red Velvet Waffles, Red Velvet Cupcakes or maybe even Decadent Triple Chocolate Poke Cake but this year I’m keeping it light with this delicious Winter Fruit Salad Recipe. I just can’t get enough of it as I’m enjoying it on the daily!! 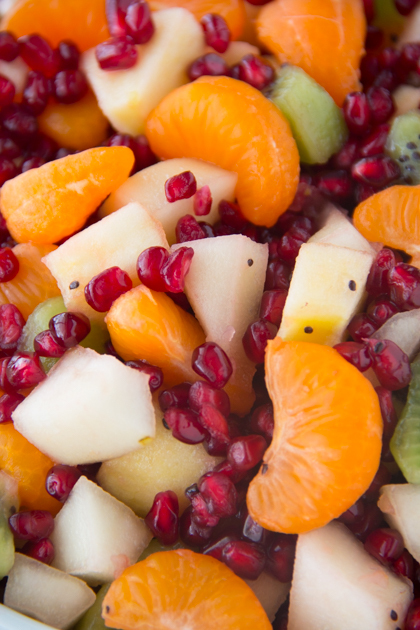 This yummy Winter Fruit Salad is such a hit in that it has sweet mandarins, kiwis, pears, apples and pomegranate seeds. It then gets tossed with a simplistic honey lemon-lime dressing. It’s super light and these winter fruit choices are just perfect when you can’t get a hold of some of those favorite summer fruits. The entire family including the grand babies just loved it!! As you celebrate Valentine’s Day with your loved ones, I pray that you delight yourself in the Lord and know that He will give you the desires of your heart according to Psalm 37:4. He is certainly faithful over His Word. Have a wonderful Valentine’s Day! Say Grace and enjoy!! 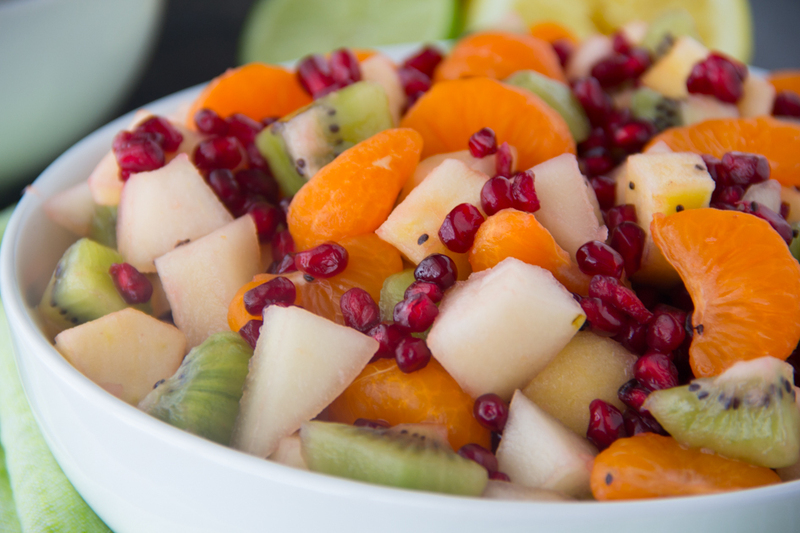 This delicious fruit salad combines fresh mandarins, kiwi, apples, pears, pomegranate seeds and a light honey lemon-lime salad dressing. In a large mixing bowl combine all fruit. Combine honey, lemon juice and lime juice, until mixed well. Pour dressing over fruit and toss well. Say Grace and enjoy!! How light and refreshing! And I love all that color to help brighten a cold winter day. Yum! For sure!!! Thanks for stopping by! I really love winter fruit salads. I keep telling myself I’m going to make one but I haven’t gotten around to it yet! Nothing like a cool refreshing fruit salad. Such a great dessert or side dish idea!!! This is perfectly fresh and light! I need to be eating more of this type of salad and less chocolate. Happy Valentine’s Day! Haha!!! Right there with ya Lisa!!! Such a beauitful fruit salad, with little pomegrante jewels and lovely delicate fruits. 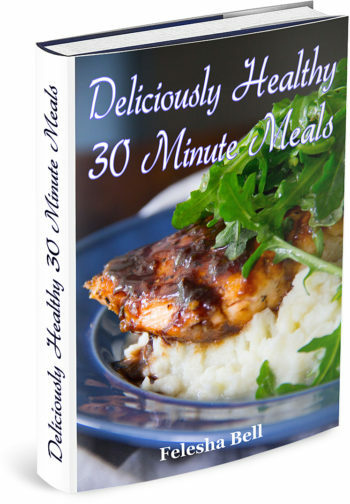 Lovely that you’ve used honey in the dressing. Totally loving this winter fruit salad. Colorful, yummy!